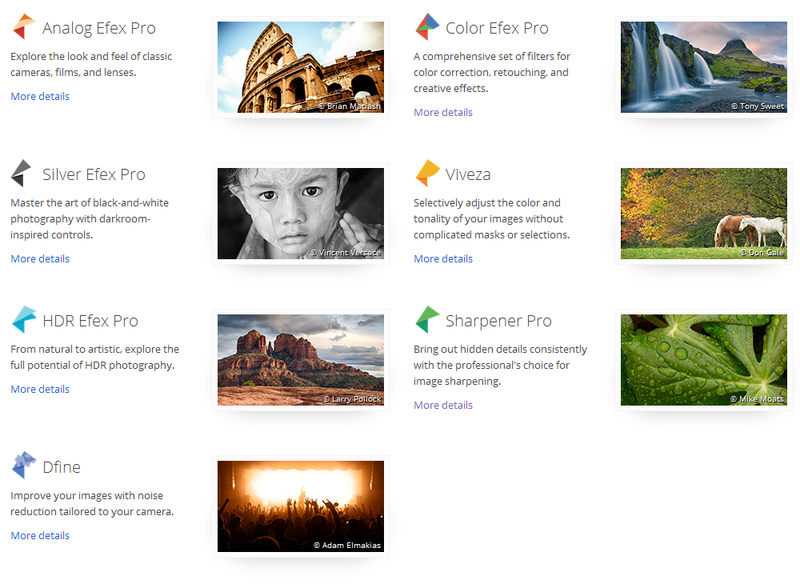 Google just announced yesterday (March 24, 2016) that it’s making its Nik Collection of desktop photo editing software 100% free. In 2012 after Google bought Nik Software it was pretty big news when months later Google made the collection available for only $150. Well now the whole collection can be had for free. What is the Nik Collection? The Nik Collection has 7 plug-ins that provide a range of photo editing features, including photo filters, retouching and correcting photos, darkroom retouching, adjusting color and tonality, perfecting black and white output, HDR, image sharpening, and noise reduction. While I don’t personally have experience with this collection it’s hard for me to guess at the real value to you, or analyze the pros and cons of such an offering. Leave a comment below if you can weigh in on the matter. A tip I’ve read was that some apps in the collection don’t look to offer a “open” button in the interface (Dfine, Sharpener, and Viveza) you can still choose “open with” from the right-click menu to open each photo in the program. This may be tedious for processing a lot of photos but it is free. People talking about this release are quite excited by Silver Efex Pro being included as it’s an elaborate, top class, black and white tool that can achieve effects in seconds that would take quite a lot of time and technique to achieve in Photoshop. Go get it, or read more about the offering from Google’s own Nik Collection site. Also if you have the time, here is a one hour tutorial on Youtube put out by Google Nik Collection titled “Introduction to the Nik Complete Collection”. An introduction to the Nik Complete Collection. Watch this in-depth session covering the Complete Collection from start to finish. We will cover noise reduction, optimizing color and contrast, stylizing images, as well as sharpening an image for output. This webinar will not only streamline your workflow but also cover the thought process of figuring out what you want to do to your image to give it the most impact possible. TL:DR: Go get Google’s Nik Collection here. Update March 28th: Now that the collection is free, I’ve run across some video tutorials that may help you further. The YouTube channel “Photos in Color” is doing up a little series on the collection. The first 2 parts of the series are up now: Introduction and Install Nik Collection and DFine 2 Reduce Noise. They say they will be featuring a new app in the Nik collection each day so be sure to check with them if you are enjoying what they are making so far.